What was Marsilio Ficino’s contribution to the spirit of the Renaissance? Marsilio Ficino (1433–1499) was ordained a priest in 1473, and from the center of cultural life in Florence he attempted to draw people to Christ through Platonism. Although he was the first to translate Plato’s dialogues into Latin, he was not a purist; he also provided translations of Plotinus (205–270) and other Neoplatonists. 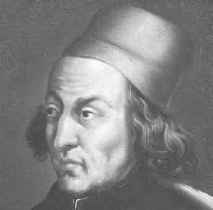 Ficino believed that Plato got his ideas from a legendary Egyptian magician, Hermes Trismegistus, whose work he also translated. Ficino claimed a form of wisdom that combines religion and philosophy. His own Three Books on Life suggested the idea of a world soul that was connected to the world’s body by occult means. In human beings, a similar relationship holds insofar as the “astral body” connects body and soul. This parallel structure of the world and human beings is what makes spiritual advancement, as well as the attainment of worldly goods, possible through the practice of magic. Ficino’s worldview and spiritual beliefs were so clearly opposed to Aristotelian Christianity—as well as probably being heretical—that their very circulation signaled important cultural changes, if not the demise of orthodoxy. Marsilio Ficino was a priest who used the works of Plato to argue for Christianity (Art Archive).